One of my earliest memories is of missing my friend Jospehine’s birthday party, because I was stuck at home with raging earache. My kind big sister spent some of her pocket money on a comic for me, in the hope of cheering me up but, whilst this made enough impact that I still recall it, my disappointment at missing out on some fun is also keenly remembered. I felt a bit that way this week, my attention caught by the tweets coming out of conferences here in the UK on overdiagnosis (#POCD2014), public health (#PHE2014) and midwifery (#RCMWales). I’m also watching many of my Cochrane colleagues preparing to go to Hyderabad for the Cochrane Colloquium (#CochraneHyd), starting on Monday, leaving me at the UK Cochrane Centre trying to keep the pot plants alive. Social media means you’re in, not out! 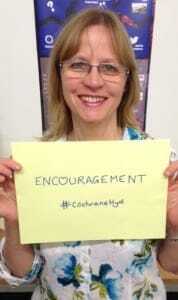 #CochraneHyd: A chance to offer each other encouragement, wherever we are, thanks to social media! My first thought is that I’m missing out. Yet thanks to social media, I’m joining in and not just with one event but with several. It’s true I’d love to be talking to people face-to-face, though the reality for me, as someone with hearing loss, is that conversation in big, crowded venues is generally difficult. How fantastic, then, that I can be in several places at once and join in the conversations as well as any of you. What’s more, thanks to the democratic nature of social networking, I can talk to anyone who has a presence on the same platforms as me, neatly leaping over the obstacles of access and hierarchy as well as geography, which limit our opportunities for networking in person. Those attending #CochraneHyd in person OR virtually will be able to come together through social media to participate and collaborate. We’re already being invited to post a photo of ourselves on Instagram, Facebook or Twitter, with one word summing up what #CochraneHyd means to us. It’s thanks to social media that, for those of us not there in person, that word doesn’t need to be ‘excluded’. Your brain and your fingers have to work really fast if you’re tweeting an event but help is at hand. My favourite is http://www.tchat.io which you sign into to follow a hashtag and you’ll then see just those. You can do all the usual things with your tweets and the hashtag is automatically added – very useful. Having organised yourself, what are you going to tweet? 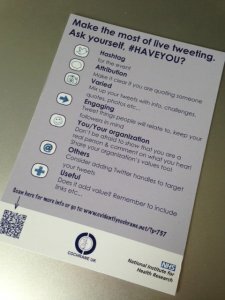 If you haven’t seen my checklist for maximizing your event tweets in this earlier blog, here it is. The #HAVEYOU checklist is available here as a PDF HAVEYOU flyers . If you’re attending #CochraneHyd, you might like to join Holly’s workshop on Engaging at Events through Social Media on Tuesday. There’ll be #HAVEYOU cards for you to take away too. Do you join in with conferences or other events through social media? What helped you get started and what would you say to others to encourage them to join in? We’d love to hear! I really like your article. We’ll add it to our list of useful social media resources on our UK Cochrane Centre website. Perfect title I think Sarah! Love the #HAVEYOU. Thanks Ammar! People seem to find the #HAVEYOU checklist useful; good that it’s now available as a PDF (and we’ve had more of the cards made too). indeed, those who stay at home can be virally there! great evolution in openness. 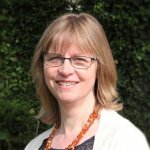 Hi, there’s quite a lot of Cochrane evidence on ventilation tubes.You might want to take a look at these Cochrane summaries of review http://summaries.cochrane.org/search/site/ventilation%20tubes This sounds like a question best answered by @CochraneENT or @MartinJBurton (our UKCC Director who is the Co-ordinating Editor of the Cochrane ENT Group). I will ask when they return to the UK next week but you could try tweeting them!